L-R Beverly M. Hall, Chapter President, Dr. Thomas B. Lockamy, Jr., SCCPSS Superintendent and Denise M. Cooper, Esq., Southern Area Program Chair, and Chaplain of the Chapter. 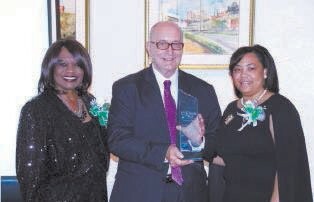 The Savannah (GA) Chapter of The Links, Incorporated kicked off its 60th Anniversary Celebration with community service projects and a reception honoring two local entities who have worked tirelessly to support programs uplifting children and families. The Chapter was one of the local sponsors of “Souls Strolling to the Polls,” an effort to encourage members of churches to provide transportation and support for those who stood in lines to vote on Sunday, October 30, 2016. Chapter members prepared and presented 60 personal care – hygiene bags to Safe Shelter | Center for Domestic Violence Services – Savannah, a center that provides temporary emergency shelter and confidential services to victims of domestic violence. An additional community service project included as a part of the 60th Anniversary programming was the sorting and packing of 244 boxes, over 10,000 pounds of non-perishable food at America’s Second Harvest of Coastal Georgia, Inc., Savannah, GA. The boxes were delivered to four neighboring county food bank locations. An elegant champagne reception was held at the beautiful, historic Beach Institute African American Cultural Center, on the afternoon of November 13, 2016. A video presentation that shared segments, articulated by members of the Savannah (GA) Chapter, of the organization’s presence in the Savannah community for 60 years, and the recognition of two long standing community partners, the Savannah-Chatham County Public School System (SCCPSS) and the City of Savannah’s Department of Cultural Affairs, were the highlights of the afternoon. Eight of the nine living past presidents of the Chapter were in attendance and also recognized with special presentations. The Chapter will celebrate a full year in recognition of 60 years of friendship and service. Dr. Connie S. Cooper serves as the 60th Anniversary Steering Committee Chairperson along with Dr. Dionne Hoskins-Brown as Co-Chair. Ms. Beverly M. Hall is Chapter President.